Sloto Summertime is Such a Sweet Life! August has arrived and with it comes steamy summer sunshine, long lazy sun filled days and the sweetest winning opportunities Mr. Sloto has ever given you! It all begins when you deposit as little as $25 to play with up to a 225% Match and 50 Free Spins. 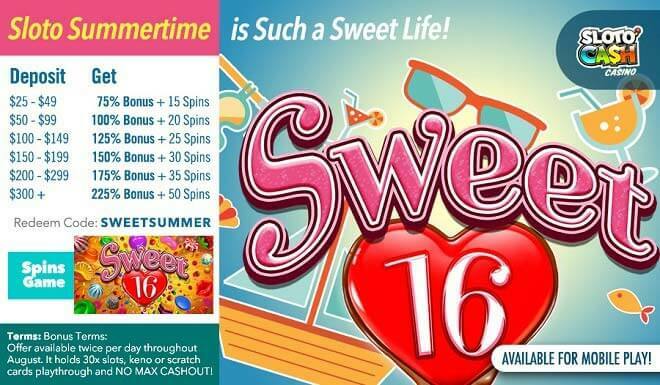 Play for wins when spinning the reels of Sweet 16 with help from jellybeans, lollipops and toffees. You’ll also enjoy some delicious good times when the reels collapse for even more winning combinations! Tame your sweet tooth and your winning cravings this August when you play with Mr. Sloto’s sweetest inventions yet!